*Includes $490 Values with All 6 Cover Hem Stitch Guides and Feet: Single & Double Fold Hemmer, Bias Tape Holder, Bias Tape Binder, Double Fold Binder, Belt Loop & Top Stitch Foot. 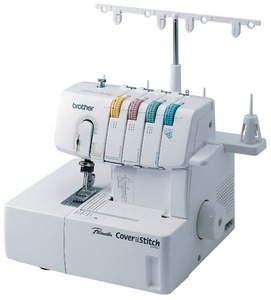 Brother Pacesetter 2340CV Cover Hem Stitch Machine with all 6 major accessory guide feet, for less than the price of Janome or Elna 3 Needle CoverPro machines WITHOUT their $499 in extra accessory feet! AllBrands is an Authorized Brother Dealer and Service Center for any repairs needed including warranty parts, electrical and labor. We give unlimited technical support by email, fax and phone. We service machines in our stores. Mass merchants do not have tech service or repair departments for your equipment. They are unable to help you directly, only referring any operational, mechanical or electronic questions back to the manufacturer instead of taking care of the problems themselves. Manufacturers and customers should expect that any problems you have will be taken care of by the dealer or merchant who sold you the equipment, not by just referring your questions back to the manufacturer. Easy to follow lay-in threading. Fast and easy looper threading system. Dial adjustment for stitch length up to 4mm. Stitch length adjustable from 2mm to 4mm. Presser foot fabric pressure adjustment. Slide lever adjustment for differential feed helps prevent puckering, or can gather light weight fabrics. Differential feed for perfect seaming on virtually any fabric type. Eliminates the wavy or stretched appearance of stitched fabrics. The cover stitch is what gives garments their professional looking finish. This stitch called a cover hem was previously available only on the highest-end sergers. The Brother 2340CV is a more economical model, offering a wide 6mm, triple-needle cover stitch and a chain stitch. Because they only do these two types of stitches, they're extremely fast—up to 1,000 stitches per minute—and much easier to set up and use. They look more like regular sewing machines, and offer familiar features that make them easier to use than sergers. The cover stitch is especially suited to stretchy fabrics like knits, as well as the popular new blends of traditional woven fabrics with a small percentage of stretch fiber added for extra flexibility. The Cover stitch series machines are ideal for constructing projects from fashion tops to competition ice skating costumes. The cover stitch is a serger type stitch made without the knives (no fabric is cut), so it can be used not only to finish hems, necklines, collars and cuffs, but also for decorative effects in the middle of the fabric. Cover stitches can be made with two or three needles. For example, a double needle cover stitch will show two lines of straight stitching on the top of the fabric with the two lines joined by a looping stitch on the bottom side. Because both sides of a cover stitch are finished, it looks great with decorative thread. Chain stitch One-needle, two-thread double chain stitch. For tape binding, joining woven fabrics and decorative effects. Expand your creativity with Brother's advanced technology. Brother 2340CV Cover Stitch Machine - Removing Fabric Tutorial. This tutorial will show you how to remove the fabric from your Brother 2340CV Cover Stitch machine. This can be a somewhat challenging task at first, so I hope this video helps. For more information or to ask me any questions, please visit my blog at http://www.sewilluminated.com. Thank you! One-needle, two-thread double chain stitch. For tape binding, joining woven fabrics and decorative effects. Create special effects by using novelty threads in the lower looper. Two-needle, three-thread cover stitch. For hemmig on fine fabrics, tape binding and top stitching. Three-needle, four-thread cover stitch. For hemming, decorative effects, elastic and durable seams for sportswear. Two-needle, three-thread cover stitch. For hemming, top stitching and decorative effects on T-shirts and knits. Chain Stitch: One-needle, two-thread double chain stitch. For tape binding, joining woven fabrics and decorative effects. Decorative Stitch: Create special effects by using novelty threads in the lower looper. Narrow Cover Stitch (3mm): Two-needle, three-thread cover stitch. For hemming on fine fabrics, tape binding and top stitching. Tri-Cover Stitch (6mm): Three-needle, four-thread cover stitch. For hemming, decorative effects, elastic and durable seams for sportswear. Wide Cover Stitch (6mm): Two-needle, three-thread cover stitch. For hemming, top stitching and decorative effects on T-shirts and knits. Karen, there are various ways of ending stitches on your Brother 2340CV coverstitch machine. For chaining off you can hold the fabric and coverstitch chain behind the foot with finger pull tension while sewing off, or sew off onto a scrap of fabric/tissue paper. For tacking at the end of seams, flip the fabric to sew over your previous stitch line, or even turn the hand wheel backwards a few stitches to lock.. If you want to release threads at the end of a seam, you can lift the presser foot up and rock the handwheel back and forth while pulling on all 4 threads, move the looper to the threading position, pull thread slack in front of the two needles, or even turn the tension dials to zero and pull all the threads through at the same time. You should not have to hold each tension dial release button down at the same time. Those buttons where meant to pull thread changes through without any tension, one dial at a time. The 2-thread stitch is for overcasting a single layer of fabric. It does not have the seam, only the overcast. Of course, you can overcast with the 3 or 4 thread stiches as well. The overlock stitch is a seam with overcast built in. It can be 3, 4 or 5 threads. 3 thread would be for very light weight fabrics, since it's narrower. 3 and 4 thread stitches have stretch, so they are the best stitches for knits, but can also be used on wovens. 4 thread stitch is wider than 3 thread stitch, so it is better for medium weight fabrics. The 5-thread stitch is a straight chain stitch and a 3 thread overlock (separate) and is for heavier fabrics and wovens, since it does not stretch. Flatlock is a variation of the 2-thread or 3 thread overlock stitches. The tension is adjusted so there is no seam, only the overcast. When you sew 2 layers together and pull them flat, the seam allowances are enclosed, so they do not stich out to fold to one side or the other. The fabric is pulled "flat." On one side the stitch looks like a normal overlock stitch. On the other side it has threads going crosswise, like a ladder. The stitch is often used decoratively with special threads in the looper. It is used for patchwork or knit garment seams. It's nice to have a serger and a separate coverstitch machine, especially if you will use the coverstith often. It saves you time converting from one stitch to the other. However, that's not always practical, space-wise. Once you've made the change a couple of times, it will become quicker and eeasier for you. You can leave the chain stitch looper thread (also used for the coverstitch) through the threading path (except the eye of the looper), so you can tie on and pull new threads through, thus saving a lot of time when you make changes. The sergers and coverstitch machines you listed are all good quality. None are made in Japan. However, the production is supervised by the Japanese and we have not noticed any quality problems since the production was shifted out of Japan. The advantage of the Juki MO735 is that it is the most heavy-duty machine, since Juki uses their industrial parts and expertise in its manufacture: http://www.allbrands.com/products/abp05031-0267.html. 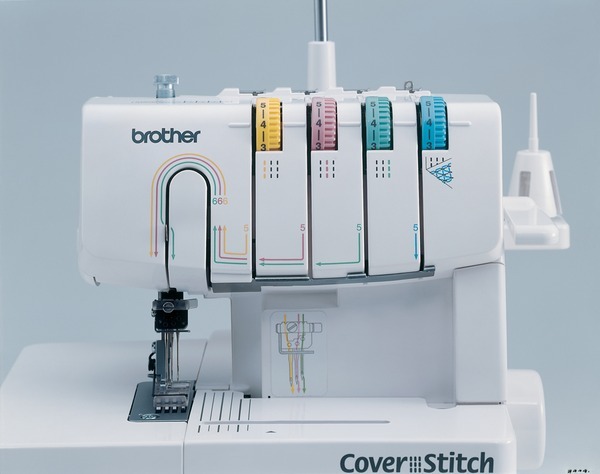 The advantage of the Brother 2340CV is that its coverstitch is a little bit wider and it has some wonderful accessories to help you guide your fabric for various operations. My first choice would be to get one of the Juki 4 or 5 thread sergers and the Brother coverstitch only machine. We also carry the Brother 1034D serger, which has many more features than most sergers and comes at a great price: http://www.allbrands.com/products/abp01083-0069.html. Can you tell me if this machine does the Hem stitching that is used on baby blankets where the crochet goes in the holes it makes? AllBrands recommends MaxiLock Serger Thread for all brands of Coverstitch and Serger Machines....Less fuzz for smoother delivery and greater tensile strength for less thread breakage. John Douthat, Owner & Tech. Beth, yes, sewing off on a scrap of fabric or tissue is better than trying to sew off on air, even when pulling thread chain with fabric gently from behind the foot. I am more familiar with what we do in the shop when we get to the end of the fabric. We rock the hand wheel back and forth while pulling on the fabric and thread chain to the left and under the foot (even finger pulling slack in needle threads anywhere above the needle eye). Rocking the hand wheel back and forth releases thread from the take up lever and produces enough slack in the thread to pull off in increments. You can alsocut the thread tail leaving an inch of so to weave back into the stitches on the fabric with a seaming needle, or cut off thread chain at the fabric edge and use a drop of fabric glue (Sewers Aid) to secure.. If you are sewing tubular cuffs, sleeves or hems, just sew over where your started from to lock in the stitches. Thanks for offering competitive prices and for sponsoring SewForum! Thanks for a great online ordering experience. Love doing business with your company! Prices, selection of product lines, and speed of delivery greatly appreciated. Kudos to all your staff. Thanks, I am very happy with my new machine! My wife had been using her mother's early 1960's Singer until last year. She wanted the PRW6800 which I got her. She was amazed at how well it works. She loves the needle threader and the automatic thread cutter. She then wanted the 1034D serger, which we also bought. She is thrilled with how well it works. I was the one who convinced her that she needed a coverstitch machine. I read up a lot about it and think we made the right choice in buying a separate machine instead of a more expensive convertible serger. I went for the machine with the accessories because I thought a few of them would make the machine more useful. The additional cost was well worth it instead of buying them piecemeal. We are very pleased with the Brother machines and ALLBRANDS speedy delivery. Wow Allbrands is something else! They are outstanding to deal with... Customer service seems to be a major priority to them and they go out of their way to help you before and AFTER the sale. Some companies don't even bother with the buyer after the sale is final and they have their money Allbrands company is so large but yet remains so personal and dedicated to its customers. I have purchased from them numerous times and Have been very pleased with prices, quality, fast shipping and great customer service. GREAT company!! I would give them 10 stars if I could. Sharon B.
I tell everyone about you and your great prices. I could not be more satisfied. Allbrands is FANTASTIC to deal with. The owner John took so much time by email and phone with me before my purchase of my 2340cv machine. I have been dealing with them for years and have always been extremely happy with their prices and fast shipping. I would totally recommend Allbrands for your purchase. Excellent company to do business with. Do not hesitate to order from here. I plan on being a regular customer for years to come. Thank you so much, AllBrands. I appreciate AllBrands very much. I love being able to buy needles in bulk. Your prices on machines are excellent. Thank you. Dear Mr. Douthat, I wanted to thank you so much with helping me yesterday. It is apparent that you take your business seriously and have an authentic concern about your customers. You are very professional and knowledgeable about the products you sell. You can be sure that I will be a customer again because of your business ethics. Your customer service assistant, Toby Champagne, was also very helpful and patient. Those kind of employees are an asset to your company. I appreciate her speedy intervention and tact. Tanya W.
Delivery was very fast; the pricing on the machine was better than the competitors. Didn't research the pricing on the accessories, but the free shipping took care of any hesitations I may have had. Thank you very much.